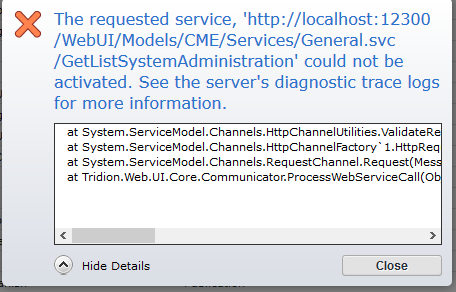 Recently I Installed SDL Web 8.5 in Windows Server 2012 R2. After Installation, when I opened the CME I got below notification error. 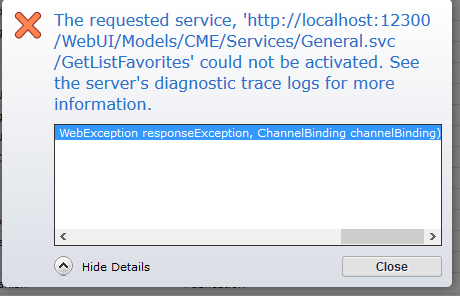 I am facing this issue only on one server and other server is working fine with SDL Web 8.5 in Windows Server 2012 R2. I think it's an environment configuration issue. The requested service, 'http://localhost:12300/WebUI/Models/CME/Services/General.svc/GetListSystemAdministration' could not be activated. See the server's diagnostic trace logs for more information. The requested service, 'http://localhost:12300/WebUI/Models/CME/Services/General.svc/GetListFavorites' could not be activated. See the server's diagnostic trace logs for more information. Not the answer you're looking for? Browse other questions tagged core-service cme gui-extensions web8.5 or ask your own question.